The Belted Cow Co. and Everything Baseball have teamed up to bring you these high quality baseball jersey tote bags. Whether you're planning a trip to the ballpark, the beach, or the grocery store, one of these totes will carry all of your valuables in style. 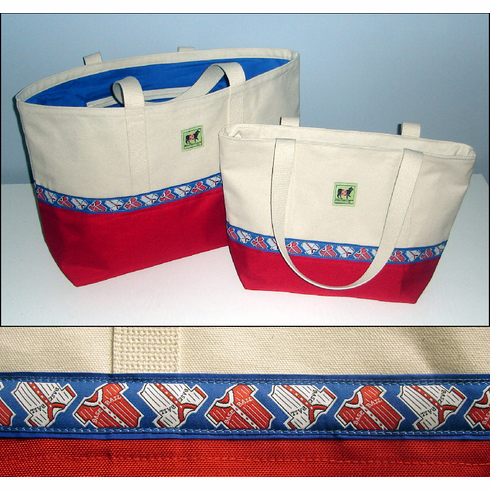 From the design to the stitching, we�ve created handmade totes that stand alone and are functional too. Have you ever picked up your tote after it sat in a wet dinghy, your kids set it down in the only puddle around, or you didn�t move your beach gear high enough before that wave washed in? If you have, you know the average canvas tote won�t keep the Palm Pilot, grocery list or your little Picasso�s latest masterpiece from getting a tad moist. These Belted Cow totes are finished on the bottom with rugged 1000 denier nylon Cordura� fabric. The Cordura, with a water-proof urethane coating, is sewn over the canvas for unique multilayer protection. But most important, we think you should carry a Belted Cow baseball jersey tote to show off your sense of humor, your appreciation for life�s simple pleasures, and your conviction that you aren�t about to blend in! Features: Our largest tote offers an interior zipper pocket and bright royal blue broadcloth lining which matches the trim on the baseball jersey ribbon. Features: A tote for all occasions, the Cliff offers over the shoulder straps, zipper collar closure with double pulls, drop in zipper pocket and bright royal blue broadcloth lining which matches the trim on the baseball jersey ribbon. These can also double as a diaper bag for baseball moms.